Much of land use and transportation planning today aims to reduce traffic congestion. However, the barometers typically used to measure congestion provide only a snapshot of a select dimension of a city's transportation system and fail to accurately reflect how easy it is to reach destinations. Comprehensive and policy relevant measures useful to land-use and transportation planning need to capture both land use and travel dimensions. 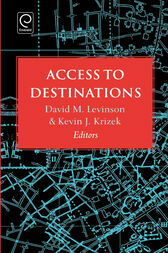 This book focuses on the science and policy around the multi-modal concept of accessibility. If the goal is to create physical environments that are accessible, this work provides an up date account that can advance empirically grounded research and planning practice relating to accessibility.